Resolution: Schlage used to offer a holdback cylinder 03-030 that could be used with the L9050, L9080, and L9082. The cylinder had a special 2-piece lazy cam that allowed the cam to be rotated only about 120 degrees when the key was rotated a full 360 degrees. The cam, upon the 120 degree rotation, would hold the transfer lever in the chassis depressed and thus the latch in the retracted position. Field failures prompted Schlage to discontinue the holdback cylinder in 2000 and offer a L9076 function that accomplished the holdback feature using internal components. 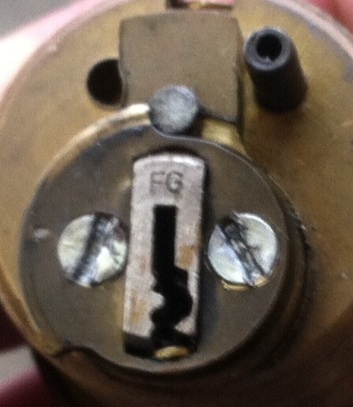 Failures of the holdback cylinder resulted in either the latch not being fully retracted when the key was removed or not being able to remove the key with the latchbolt fully retracted. This was always due to the cam not being in the correct position when the key was rotated. The holdback cylinders were handed. See the attached sheet on how to re-hand holdback cylinders in the field.